Your faithful companion and best friend will now bring in the big bucks. 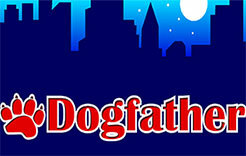 Hitting the reels in mafia style, Dogfather is now on Express Casino Online. The irresistible offer of more than just a single is one you cannot refuse. I’ll Make You An Offer, You Cannot Refuse For The Best Casino Bonuses No Deposit - Register Now! You get 5 reels and 20 pay lines, to start with. It’s up to you to choose the number of lines and set the wager per line. Go from 0.01 coin size (or a coin/line) to a max. of 0.5 coin size (5 coins/line). Spin the bone once or set to Autoplay and relax while it spins out your fortune for you. You stand to win a Jackpot of 13,000 coins or a whopping total of 39,000 coins. Not sure, try it for free once; convinced try your luck on Express Casino Online. Welcome to the doggy underworld on Express Casino Online, we have sneering mutts and guard bunnies and gold claws. But look for the Don, the alpha with the Cuban cigar or his nemesis the golden Itchy Da flea and your luck will turn. The Slots best bonus is the game’s winning feature. The El supremo in his best suit is the wild symbol. And surprise, surprise... his archenemy, Itchy Da Flea in his golden best is the scatter. Microgaming has really been generous this time around, the game has additional bonus symbols, fire hydrants! Happen on any of these symbols in the right number and you’ll be raking in the moolah. To win the Jackpot, you need to stack up to the Don. He’ll read you a book, ‘Taking Care of Cats’ to a background of a revolver’s spinning. Do that and you get away with 13,000 coins. Worry not though, if the Don feels merciful, he’ll grace your screen as the wild symbol. However, beware he won’t stand in for the fire hydrant or the Itchy Da Flea. Some feuds shall never be forgotten! Express Casino Online has chosen the Dogfather for a reason. The prize winning feature of this game is the number of bonuses. If Itchy Da Flea appears in threes on your screen, hurrah! We head to the bonus round of, wait for it. And hold onto your collars, with a 3x multiplier of the rewards, while you party to jazz number. If you land three fire hydrants together on the screen, you get to ‘Mark your Territory’, this Pick ‘Em Bonus, allows you three choices. So choose wisely and you shall be Fortune’s child. So log onto to Express Casino Online and try the Slots Best Bonus offering, Dogfather. After all, Every Dog has its day!